Tribal youth from across the Northwest work on comic book panels on another track of the recent health promotion conference. Almost one in four Native American youths has attempted suicide, according to the U.S. Department of Health and Human Services. A new initiative is in the works to combat those grim statistics through positive social networking. Brandon Trejo, 17, who lives on a reservation in eastern Washington state, knows a face behind that statistic. "One of my friends, he tried overdosing on a bunch of pills," Trejo says. "It didn't work. He ended up going to the hospital and getting his stomach pumped." Trejo was shocked and still doesn't understand his friend's actions. Oregon tribal member Sarah Hull has felt the same shock, not just once, but multiple times. The 16-year-old goes to a school off the reservation. "I know from personal experience living in a Native American community and being around people, depression is really common," she says, "because for a lot of people it's hard to find your way to your culture or find your way to a certain passion when you don't who you are and you're confused." 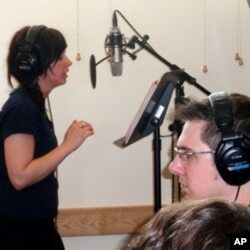 Audio engineer Brad Kaminski records a song by Sarah Hull. Hull has found her way to a passion - music. She records in a makeshift recording studio set up at a tribal health workshop.Hull lays awake at night trying to find the right words for a song on the unusual theme of suicide prevention. Her recording session is part of an anti-suicide/healthy living workshop organized by the Northwest Portland Area Indian Health Board. The regional agency invited 60 students from different tribes to come to Portland for a week. According to suicide prevention coordinator Colbie Caughlan, the staff wanted help crafting health promotion messages that would resonate with young people. "Youth learn from youth," says Caughlan. "That's what has happened forever." Conference organizers arranged presentations about suicide warning signs and healthy, drug-free living. Then they set the young people loose with video camera, drawing paper, notebooks or a music producer. Caughlan hopes the experience will unleash a wave of uplifting social networking including teen-generated web videos, music and even a comic book. "If they say, 'Oh, then I went to a leadership conference,’ or ‘I did a suicide prevention training and it taught me something so amazing that I actually helped save my best friend's life,' those are the things people are going to hold with them and tell their friends." This initiative was inspired by a successful web-based suicide prevention strategy in Australia. Todd Denny, one of the music mentors in Portland, has led musical workshops to combat social ills on Northwest reservations for a decade. He believes technology could help break the stigma around a difficult, sensitive topic. "One of the big challenges with suicide in all communities, not just tribal communities, is the silence and the secrecy," says Denny. "So a program like this allows people to break through those barriers of silence and secrecy, to express themselves, to tell their stories." Over the course of a week, some of the teens did that through traditional Native American music. Others explored the suicide prevention theme through more contemporary genres such as rap and hip hop. Jordan Hill, 19, who sings and plays guitar, chooses his lyrics carefully. "Every song that I've written is a message to somebody, which is why when I finally put out the album that I'm working on, I want to name it 'Memoir' because it's a message to everybody." Hill's message is slated to become part of a comprehensive online health resource created for native youth by their peers. The multimedia campaign, called "WeAreNative," launches later this year.